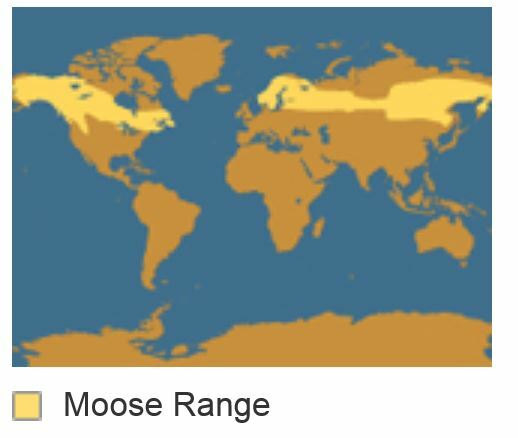 Moose are the largest of all the deer species. 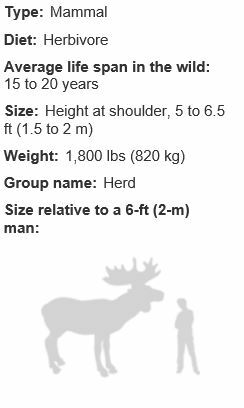 Males are immediately recognizable by their huge antlers, which can spread 6 feet (1.8 meters) from end to end. 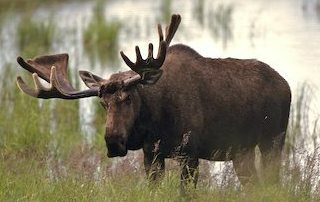 Moose have long faces and muzzles that dangle over their chins. A flap of skin known as a bell sways beneath each moose’s throat. Males, called bulls, bellow loudly to attract mates each September and October. The usually solitary bulls may come together at this time to battle with their antlers for mating supremacy. After mating, the two sexes go their separate ways until the following year. Though they may occasionally feed in the same grounds, they tend to ignore each other. Females give birth to one or two calves in the spring—each weighing some 30 pounds (14 kilograms). These calves grow quickly and can outrun a person by the time they are just five days old. Young moose stay with their mothers until the following mating season.